Air conditioning can be provided in many forms depending on the type of building being conditioned, space available for plant, the temperature and aesthetic appearance required and of course the budget available. Whether your property is a new build or a listed building, modern air conditioning systems and their controls can provide high energy efficiencies (therefore economic operation) reducing your overhead costs. Stay on top of your energy consumption and running costs with user-friendly control systems. 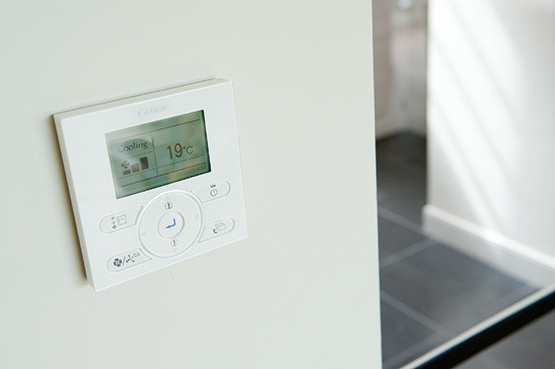 We believe that climate control should be simple, intuitive, smart and energy efficient. Whether you are looking for a solution for your home or your business, we offer a variety of systems that will help you take control of your climate and provide optimal comfort. With an online controller, you can take control of your climate from any location. Simply connect your unit to Wi-Fi and download the app. Available for iOS and Android, you can change the thermostat, set temperature schedules, review your energy consumption and develop your own “if this, then that” workflow. We offer a variety of climate control systems to help you manage your building’s energy consumption efficiently and optimise your comfort. Centralise the control of your various climate zones by connecting your intelligent tablet controller to the cloud. Simultaneously monitor and benchmark multiple locations to reduce high energy consumption. Connect to the cloud and access your units from any location at any time. Intuitive touchscreen interface guarantees easy climate control. Ideal for small to medium-sized commercial applications. We can provide intuitive and user-friendly BMS systems which integrate seamlessly with 3rd party equipment, so that you can control your climate, lighting, alarms and more with a single interface. Monitor your energy consumption, optimise your energy use and reduce your energy costs. Easy-to-use energy data trending and analytic tools leading to savings of up to 15%. Ideal for medium to large commercial applications. Individual control systems allow you to control your climate directly with user-friendly interfaces and scheduling functions. Intuitive interfaces make controlling your climate easy and contemporary designs blend in seamlessly with your interior. You can also keep track of your energy consumption with visual display graphs. Ideal for small commercial applications. Adjust the temperature, operating mode, air purification and fans for individual rooms with the interactive thermostat. The following comfort cooling systems are all heat pumps which are all highly efficient and provide heating as well as cooling, generally used within offices and shops etc. Split systems – the split system is the most basic of air conditioning systems, these are used for small to medium size rooms or offices. The system will provide either cooling or heating at any one time at one fixed temperature, in larger open plan rooms the system can comprise of either a single, twin, triple or quad indoor system with one outdoor unit. Multi-split – the multi-split system is predominantly used for commercial or residential properties where multiple indoor units can be installed to provide individually controlled cooling or heating functions in different rooms or locations, however please be aware the indoor units will either heat or cool at any one time, in other words you will not be able to run one indoor unit in cooling and another in heating simultaneously. These units are connected to a common outdoor unit. VRV/VRF systems – similar to multi-split systems, but these systems suit larger facilities as they have a larger heating and cooling capacity and have the flexibility of longer pipe runs along with the potential for increased numbers of indoor units. VRV/VRF systems can also offer simultaneous heating and cooling at any one time, when this occurs the energy is recovered within the system basically providing free cooling or heating. These systems can also be connected to heat pump boilers providing a source for heating the building via a LPHW battery in an AHU, under floor heating or used as a primary source for heating the buildings domestic hot water supply. The VRV/VRF system can also be connected to door curtains. There are a multitude of different indoor fan coil units to suit most applications, such as 4, 2 and 1 way blow ceiling cassette units, 1 way blow ceiling suspended units, above ceiling ducted units, low level wall units both exposed and hidden and finally high level wall units. 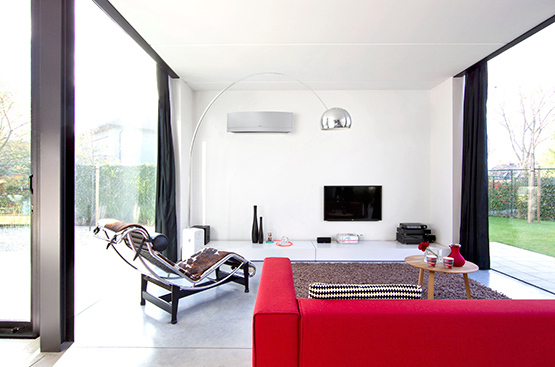 Ducted fan coil installations are mainly used in high-end residential installations where design aesthetics are paramount, a minimalist appearance is required and where there are accessible ceiling voids. Ducted fan coils combine heating and cooling performance. They can also be set up to provide a proportion of fresh air along with the conditioned air. Delivering the same quality and performance as conventional air conditioning systems, these solutions are suitable for apartments, listed properties or those where outdoor space is limited. No planning permission is normally required as the condenser is fitted internally and is easily concealed within your property.